Lake Elementaita, Nakuru County, Kenya. Dec 2015. From Wikipedia: A wide ranging species of wading bird in the heron family, Ardeidae, breeding in Africa, central and southern Europe, and southern and eastern Asia. The Western Palearctic populations migrate between breeding and wintering habitats whereas the African and tropical-Asian populations are primarily sedentary, except for occasional dispersive movements. 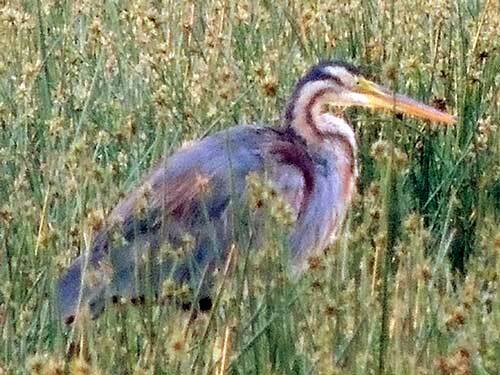 It is similar in appearance to the more common grey heron but is slightly smaller, more slender and has darker plumage. It is also a more evasive bird, favouring densely vegetated habitats near water, particularly reed beds. It hunts for a range of prey including fish, rodents, frogs and insects, either stalking them or standing waiting in ambush.